Red Hood and the Outlaws #21 Review – AiPT! 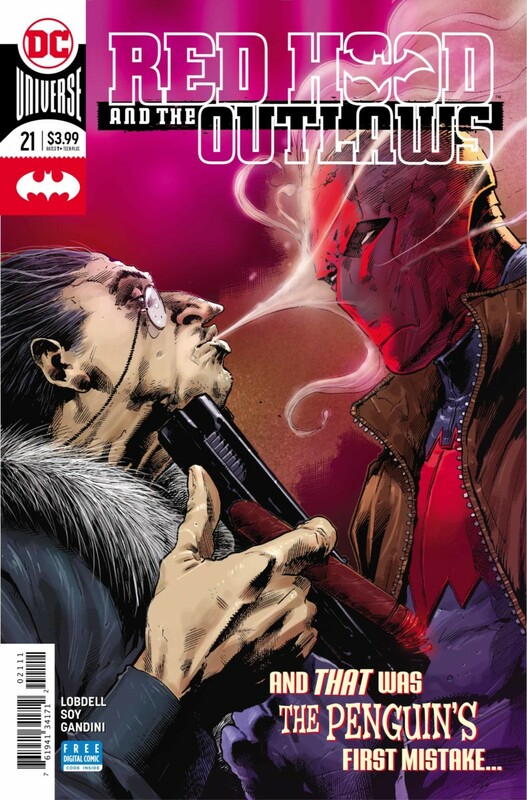 Red Hood and the Outlaws #21 sets itself up for big emotional moments but ultimately stumbles. It’s a great time to be Bizarro. Not only is he co-starring alongside the Man of Steel in the ongoing Superman series, but he’s also stuck in super-genius mode in Red Hood and the Outlaws. Although, if I am being honest, I have been over this whole genius-Bizarro thing for about three months now, waiting for an issue to save what I see as a sinking ship. Red Hood and the Outlaws #21 comes oh-so-close to being that saving grace, but ultimately fails to have any impact. Although the execution fell a bit short, I truly applaud writer Scott Lobdell for the direction he tried to take Bizarro in this issue. Up until this point, every iteration of this Bizarro arc has shown the Superman clone flexing his new mental muscle, only scraping the surface of what this synthetic kryptonite was actually doing to him. Once confronted by Artemis, Bizarro opens up about the allure of the substance and how much it affected him. Over these few panels, readers will experience a glimpse of Bizarro’s mind that mirrors the touching, infantile panels of issue #13, only this time Bizarro is able to eloquently describe the newfound machinations to this world. There’s almost a child-like wonder, frustration, and fear portrayed over these few panels that could remind readers that the Bizarro they all know and love is still in there. It’s a nice reminder of simpler times with Bizarro that possibly (and for me, hopefully) signals a return to form for him. This scene comes so close to landing an emotional blow, but instead takes an unexpected and outright ludicrous turn when Bizarro goes in to kiss Artemis only to be rejected. This was a moment that caused me to remove my glasses and disappointingly rub my nose as I thought of all the better routes this story could go. It’s an infuriating end to a conversation that was starting to build real emotional significance only to end with a completely empty and forced romantic gesture. Is that all Artemis is on this team for any more? To be a romantic endeavor for her two male teammates? She’s an incredibly powerful warrior who has proved herself to be the biggest badass on the team, yet this is the second time there has been a forced situation between Artemis and a fellow Outlaw. I just can’t see any logical reason why she keeps being used this way. Before that aggravating kiss, there’s an obvious attempt to make Bizarro into an addict that just feels flat for a couple reasons. For starters, it’s a pretty obvious connection — for months readers have known that Bizarro is abusing synthetic kryptonite despite its side effects in order to avoid returning to his normal self. More annoying, however, is that long-time (not even that long, really) readers of Red Hood and the Outlaws have already been down this narrative path where Jason helps a teammate battle addiction. Jason helping Roy Harper battle his alcoholism was a story thread used during the New 52 series and the Red Hood and Arsenal series that followed it. This is another instance where I applaud the effort to dive into a tough subject, but in the context of Red Hood and the Outlaws it feels more like a retread than anything meaningful. It’s not completely meaningless since it’s happening to Bizarro who, prior to the Kryptonite, probably couldn’t grasp the sheer idea of addiction, but it feels like Bizarro is just going through the motions that Roy established as “things you must do to be Jason’s best friend: Have addiction issues — check.” These sequences try so desperately to say something insightful about Bizarro but sadly come up short. The back and forth between Bizarro and Artemis isn’t bad by any means, save for that kiss. They simply feel like they missed the mark. Oh, yeah, isn’t this a Red Hood book? Almost forgot. During this heart to heart between Outlaws, Red Hood takes a humorous side mission to Penguin’s casino so he can launder the money he stole from Penguin — all while wearing a hilarious, over-the-top disguise. It’s a small but entertaining section of the issue that hints at what the Outlaws will be up to next (hopefully after they return Bizarro back to normal — man I am sick of this smart guy thing.). It’s not saying much given my feelings towards the past few issues of this series, but Red Hood and the Outlaws #21 is the best issue in a long time. Unfortunately, it still manages to fall short in the emotional moments it sets up while dragging the smart-Bizarro plot line along for at least one more issue. Red Hood and the Outlaws #21 sets itself up for big emotional moments, but ultimately stumbles. There's insight into Bizarro's new brain reminiscent of the wonderful musings from issue #13 that tries to bring out the child-like innocence of the old Bizarro. Jason's small side quest is short, but entertaining thanks to his wacky disguise. Sets up the next adventure for the Outlaws in the clsoing pages, which will hopefully signal the end to this smart Bizarro story. This issue feels like it has so much more to say than it actually does. Each emotional build up manages to disperse anti-climatically. Bizarro's attempt at kissing Artemis -- forced romantic relationships with Artemis is seeming to become a trope in this arc and I hate it. While using Bizarro as a personification of addiction is well intentioned, it feels more like a retread of Roy Harper's arc in the previous volume of RHATO.